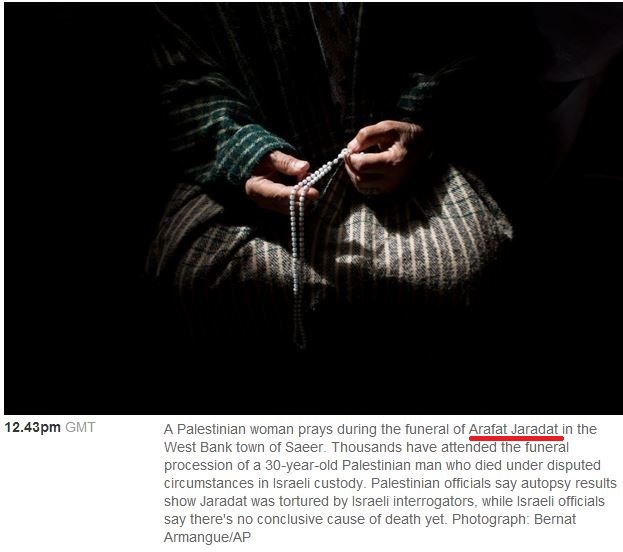 In late February, the Guardian devoted six separate news items (three stories and three photo posts) to the death of a Palestinian – named Arafat Jaradat – in an Israeli jail. 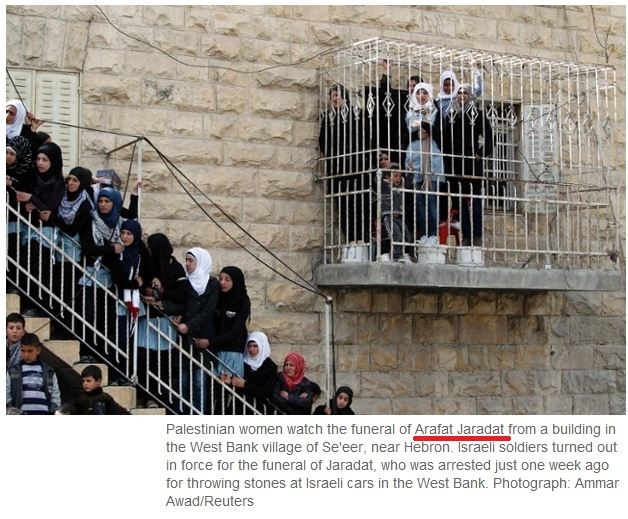 The stories, which all portrayed Jaradat and his ’cause’ in a sympathetic light, focused on baseless allegations by the PA that Jaradat, an Al Aqsa Martyrs Brigade member who was arrested for terror activity, died as the result of torture – claims which were contradicted by the autopsy performed by Israel’s top forensic pathologists. Though the PA’s claims of torture received significant coverage, subsequent reports (only a few days later) by Israeli pathologists – that the hemorrhages and fractured ribs found during the autopsy were caused by resuscitation attempts performed by medical staff, and not due to physical abuse – received no coverage in the Guardian. Indeed, such myopic and at times obsessive focus on Israeli culpability is part of a pattern at the Guardian. As a report [by Palestinian Independent Commission for Human Rights (ICHR)] shows, there has been a 10% increase in the number of complaints of torture and mistreatment by Hamas and the Palestinian Authority during 2012 compared with the year before. More than half of the 306 complaints about torture that were received last year came from Palestinians who had been detained or imprisoned by Abbas’s security forces in the West Bank, the report revealed. Altogether, 11 detainees died in Palestinian Authority and Hamas prisons last year, according to the report. One recent example of torture by PA security personnel was detailed in an April ICHR report. The complaint of torture filed by Muhammad Abdelkareem Dar Muhammad, from Hebron, was one of the major complaints ICHR received in this regard. He claimed that he was subjected to torture and ill-treatment while detained by the [Palestinian] Preventive Security Agency in Hebron. On [April 28] 2013, he was rushed to the Public Hospital of Hebron for the second time after suffering speech impairment and injuries due to being subjected to beating on the head while hand-cuffed in solitary confinement throughout the period of his detention. Yet, in contrast to the Guardian’s intense focus on one unsubstantiated accusation of torture in an Israeli jail, we were unable to find any mention at all by Guardian reporters or ‘CiF’ contributors of Muhammad Abdelkareem Dar Muhammad’s case, nor any of the other instances of torture and abuse of Palestinian prisoners in PA jails. Though we’ve often charged the Guardian with consistently engaging in ‘activist journalism’ – searching for evidence to buttress preconceived pro-Palestinian conclusions – this observation is likely only half correct. The ubiquity of reporting alleging Israeli mistreatment of Palestinians stands in contrast to the dearth of stories in the paper highlighting Palestinian mistreatment of fellow Palestinians – all of which suggests that advancing a narrative of Israeli oppression is of far greater concern to their reporters than genuine advocacy on behalf of Palestinian human rights. The Guardian is the house magazine of the Palestinian Authority. Their support for the Arab jihad against Israel is a disgrace, and I hope to see them pay for their lies one day. It is quite obvious the Guardian is racist towards Arabs as well. It think of them as people who should not be held accountable for these actions. He treats them like children are treated in the legal system. The Guardian correspondents are probably very keen that people who fire rockets at civilians be prosecuted and, if found guilty, be jailed for long periods. How about you – would you like to see people who fire rockets at civilians be prosecuted? Or are you too much afraid they’d be found guilty and go to prison for long periods? Hey, nick-a-Nazi (aka nick adler), you seem still upset for being banned from harrysplace and elderofzyon. Get over it: you are a nauseating bore. I’m glad to see you agree that members of Hamas and PIJ should be considered criminals, and not freedom fighters, for their deliberate targeting of Israeli civilians (and their use of Palestinian civilians as human shields). When will CIF Watch write on Israeli settlers’ violence against Palestinian civilians in the West Bank? Why don’t you use the ‘search’ function on this page to find out for yourself? Or don’t ‘lawyers’ actually do any background prep any more? “Lawyer”, what a joke. More of a lawyerist full of anti-Israel hatred. Do you by any chance know how many children under the age of 18 are in Palestinian jails or custody, and what they are charged with. The FCO has a dossier about Israel about the above, and it would be good to have a response. Britain has 1,292 juveniles in custody. I must be living in an evil, apartheid dictatorship.